Toddler Approved! : Pop the Top for Kindness! Pop the Top for Kindness! As part of our 100 Acts of Kindness challenge, we keep track of the acts of kindness in a variety of different ways. Last week we used our Kindness punch box, which was a big hit. 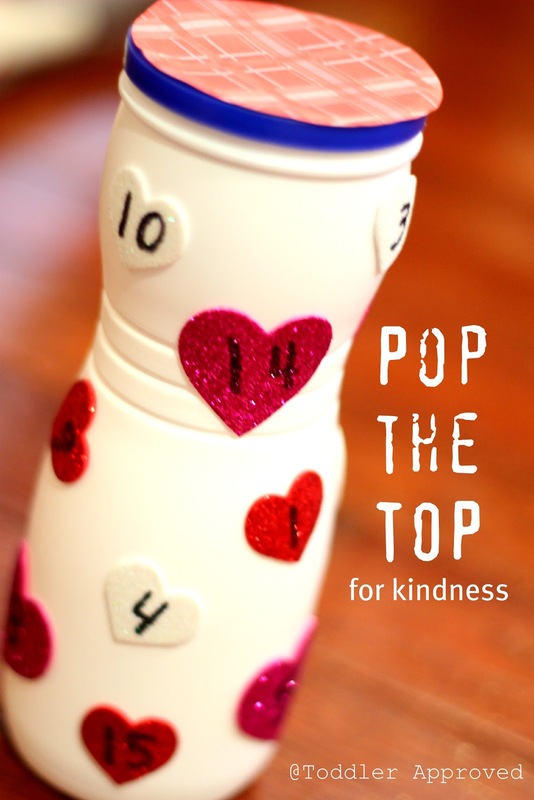 This week we are going with a simpler route and created this Pop the Top for Kindness container. Each time your child does an act of kindness, he gets to take off a heart sticker and pop the top and stick the sticker inside this little container. I am having my son count each act and remove the numbered hearts in order so that we are also practicing counting and number recognition up to 25. Check out the instructions below to make your own! 1. Write numbers to 25 on your stickers. 3. Have your child stick the stickers all over the container. 4. Cut out a circle for the top and stick it on with double-stick tape. 5. Put the container in a location where it is easily visible/accessible and enjoy your day! 7. Then pop the top! 8. And stick the sticker inside and close the container back up! I love this little activity to go along with our kindness challenge because in addition to being fun, it works on little fine motor skills (pealing stickers, opening containers) and number skills! Aaah what a very cute idea and activity. Love it. What a great way to show progress! Awesome idea. Thanks for linking it to Monday Madness.